Mile High Coatings can give you a totally unique, custom look to your concrete through concrete acid stain. This process involves using a mild acid with color to induce a chemical reaction in your concrete that results in magnificent permanently colored concrete. Concrete staining is ideal for basements and commercial spaces and also great for outdoor patios! The possibilities are endless! The key to the perfect looking stained concrete floor is the quality of our sealers and our industry leading preparation. We only use the highest quality prep materials. We prepare the concrete surface using our concrete diamond grinder to get the floor smooth and clean. Then we apply our proprietary dye/stain and seal it with our SHP Polyaspartic clear coat. The benefit is that you get the aesthetic beauty and appearance of an acid stained floor with the performance of an industrial-grade coating. For outdoor patios and walkways, we can add a traction additive to our clear coat to ensure a non-slip surface. This allows you to have a beautiful stained concrete area with the durability of the SHP Polyaspartic. Crack repairs, spalling (pits, divots, holes, etc) repairs or other patching can be completed. However, sometimes leaving the flaws alone will often add to the character of your floor. Removal of existing coatings, sealers, carpet glue or mastic is generally not a problem. Our professional equipment and experience will make sure that the concrete is suitable and clean before we apply any stain and/or sealers. 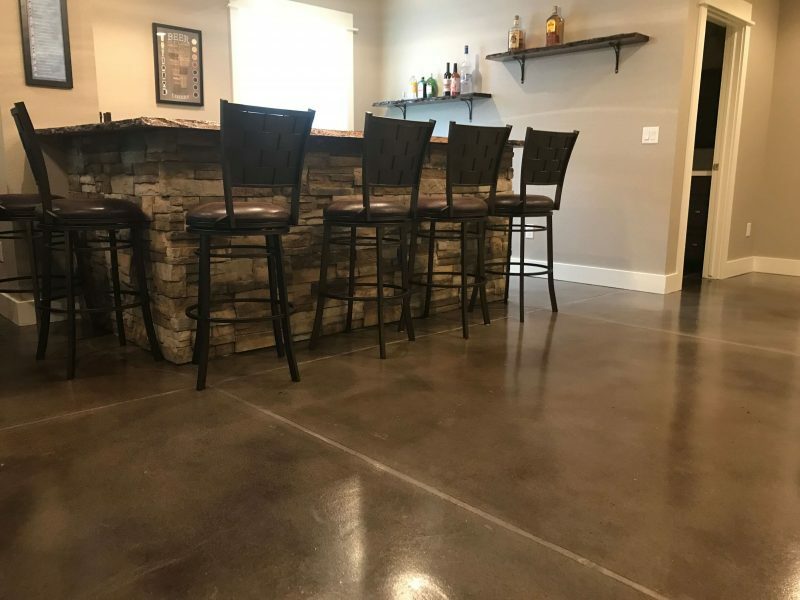 Being upfront, honest and acting with integrity is a fundamental reason why Mile High Coatings is among the best concrete stain companies in Fort Collins & Northern Colorado. The vast majority of our work comes from repeat customers and word of mouth referrals. FREE 100 SQ FT OF CONCRETE STAINED WITH ANY HOME PAINT JOB OVER $4000! Concrete floor acid stain application is an art. Mile High Coatings has the experience to safely apply a wide variety of custom concrete effects with minimal environmental impact. Unless you have had plenty of experience with acid concrete stain and concrete floor stain don’t try this at home. Concrete floor acid stain is just that…acid. Not only is it a chemical but it is very hard to use and apply to get a desired special colored effect. Call us today to arrange your FREE quote! Another fun (growing in popularity) application we can do is create a metallic epoxy floor. This unique, marble-looking floor coating is not a concrete stain but it’s not your typical epoxy floor, either. This application involves thorough diamond grind preparation, a prime coat and a thick application of a metallic epoxy coating that will settle, flow and move to it’s own pattern. These floors definitely inspire the WOW response from visitors to your home! An optional, recommended clear coat can be applied on top to help the epoxy keep it’s shine and appearance. These floors can even be installed on wood substrates such as the subfloor in your home. Because of the thickness, it can act like a insulator and it reduces and practically eliminates radon passage in the floor. Additionally, this is a very low odor and potentially Zero-VOC application. We use the highest quality concrete stain available. No other concrete stain company can get our proprietary products! Locally owned in Fort Collins, CO.
Have a question or concern? Then call us and we’ll get it addressed right away! I have drywall mud OR carpet glue OR paint on my concrete floor. Do you clean the floor before staining it? Yes. We either clean it very well prior to applying an acid stain. If we are using the dye (also a stain), we will diamond grind the floor, which cleans and profiles the concrete prior to staining and sealing. Will you remove my old carpet or tile floor? Yes! We are happy to remove and dispose of any old or existing flooring you have. Do you repair cracks in my patio or basement floor? With stained concrete, many times we leave the cracks alone and chalk it up to "character." However, if it is wide or deep, we can certainly repair it. It's totally up to the customer if they want it filled in or not. It depends. We have low or no-odor options. These are typically high-solids content coatings or water-based coatings. We also (mostly) use solvent-based coatings that do smell. For basements, we can provide and set up a fan in a window or doorway to help facilitate airflow to help alleviate the smell during the curing and out-gassing process. And, it's a good way to chase off any spiders you may have lurking in the basement! Do you have samples of the stained concrete? We provide samples, when possible, on the slab to be stained. This is because every slab is unique with finish, color, etc. Plus, concrete samples would be really heavy and we don't want our salesmen's muscles to get too big.